Convenient MS Excel sheet to perform the Horowitz-Test. The Horowitz-Test is applied to compare two discrete choice models where neither one model is a restricted version of the other. In discrete choice analysis usually a likelihood ratio test is used to compare models in terms of model fit. This particular test is only valid to test so-called nested hypotheses. Roughly speaking, a nested hypothesis implies that one model is a restricted version of the other. For example, model A contains the exogenous variables travel-time and travel-cost, while model B only contains travel-cost. As such, model B is a restricted version of model A. A second example is the comparison between an alternative-specific specification of travel-time and a generic specification of travel-time, i.e. the generic specification (travel-time coefficients are constrained to be identically) is a restricted version of the alternative-specific specification. Certainly, in practice there appear situations where one model is not a restricted version of the other. For example, model A contains travel-time, while model B contains a log-transformation of travel-time. Of course, neither is model B a constrained version of model A, nor is model A a constrained version of model B. Another example is, if we want to compare a model including the variable cost with a model in which the variable cost is divided by income (in order to replace the variable cost). Now, if we want to compare these two models, it is best practice to use a non-nested hypothesis test – here the Horowitz-Test (Horowitz, J. (1983): Statistical Comparison of Non-Nested Probabilistic Discrete Choice Models. Transportation Science 17(3), 319-350). In this test, the null hypothesis that the model with the lower adjusted likelihood ratio index (adjusted rho-square) is the true model is rejected at the significance level determined by the standard normal cumulative distribution function. Ben-Akiva, M. and Lerman, S. (1985): Discrete Choice Analysis. Theory and Application to Travel Demand. MIT Press. Koppelman, F. and Bhat, C. (2006): A Self Instructing Course in Mode Choice Modeling: Multinomial and Nested Logit Models. Technical Report, p. 95. 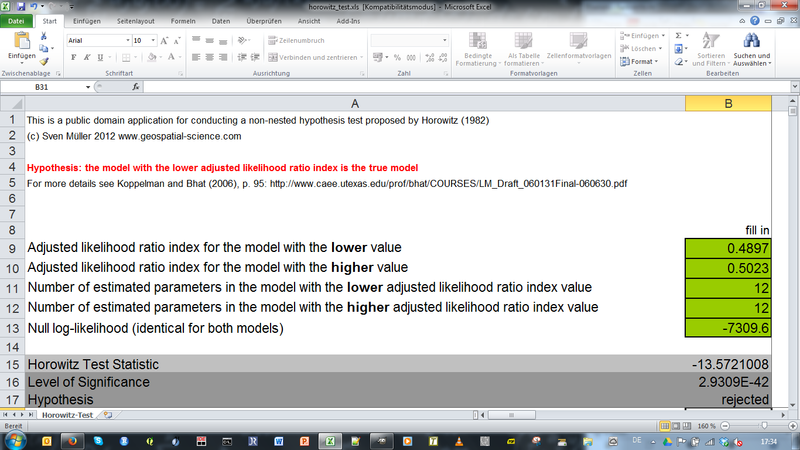 A MS Excel-Sheet to perform this test can be downloaded here (Tools).